How can a salesperson gain better results from every sales call? By mastering the art of asking questions. A good question is the salesperson’s single most powerful tool, one that can be powerfully used in every stage of the sales process, from making appointments to closing the sale to following up afterwards; yet, most salespeople are ill-equipped to use this powerful tool effectively. As a result, they find themselves dealing with “price” issues, and wondering why the customer purchased from someone else. 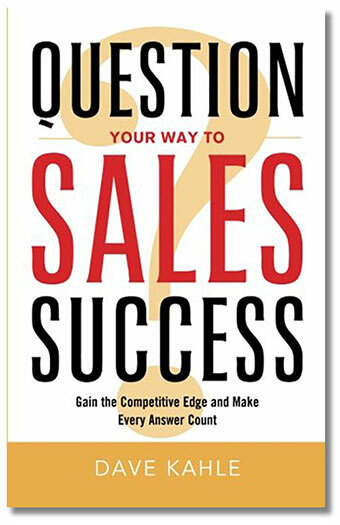 Dave Kahle’s latest book, Question Your Way to Sales Success, is a must-have for every sales professional and sales manager. After reading the book, distributing it to my team, and implementing his method, we have noticed a faster process to get to the decision making stage of the sales cycle. This book outlines the sales process and what questions to ask at what time to gain greater insight into uncovering the real reasons companies make purchasing decisions. In this time of constant price objections, using Dave’s techniques allow us to develop more meaningful partnerships by truly understanding our customer’s needs.– Michael G. Sauders, Vice President, Winwholesale,Inc. Is your primary tool for collecting deeper and more detailed information about your customer. Can make your customer think about what you want him or her to think about. Is an effective tool to create the perception of your competence in your customer’s mind. Is your primary tool for gaining agreement from your customer. The unrecognized, ultimate power behind a good sales question. How to analyze the language in a question to make sure it serves your purposes. How to create better sale questions with a foolproof, step-by-step process. The subtle techniques that allow you to deliver a question more effectively than ever. Kahle analyzes hundreds of real questions, developed by real salespeople, to provide you with practical and realistic information. Your sales strategy will never be the same again…and neither will your results!